Editor’s Note: This summer will mark the 100th anniversary of World War I’s outbreak. Today, contributing editor Nicholas K. Johnson brings us the second installment in a five-part series on alcohol, drugs, and the Great War. You can read Part One here, Part Two here, and Part Three here. 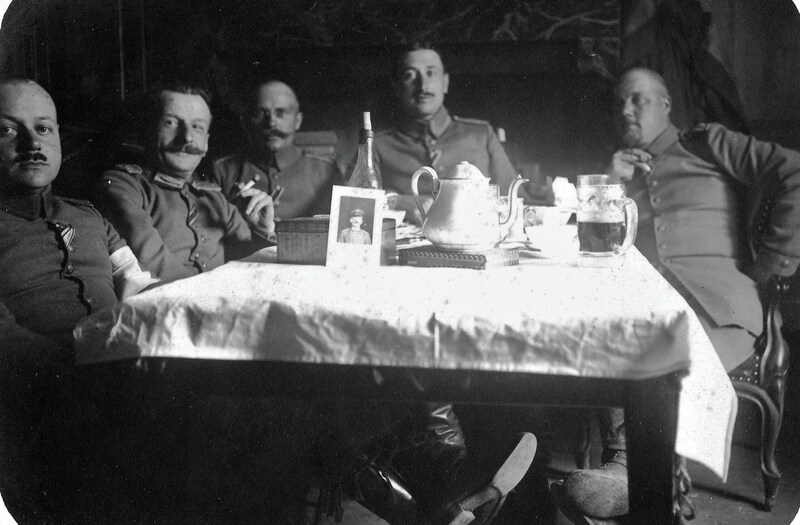 The German army’s experience with alcohol during World War I was more varied than that of their Allied counterparts on the Western Front. This was due in part to the strong degree of regionalism within the German Empire and its army. Units from Bavaria were much more likely to be issued beer as part of their daily ration than units from Prussia or the wine-producing regions of the Rhineland. The German home front also had to deal with food shortages due to the British naval blockade, which placed stresses on the alcohol industry due to an increasing demand for foodstuffs key to alcohol production such as potatoes, barley, and sugar. This shortage eventually affected those in the front lines. When the German army invaded Belgium and France in August 1914, many soldiers took advantage of the opportunities these newly-conquered territories had to offer. Discipline in rear-echelon units was lax. Hermann Baumann, a baker in the VII Reserve Corps, recalled his unit discovering an “empty house” on September 4, 1914. The house contained 500 bottles of wine in the cellar. Half of his unit became drunk, and four men– including Baumann– took 30 bottles to carry with them during the advance towards Paris. (German supply units were horse-drawn; looting of this scale would have been impossible in the infantry). On September 8th, Baumann’s unit discovered a cellar with 15,000 liters of wine. He later recounts discovering the cellar full of wine barrels. His fellow bakers and supply train drivers tried several of the barrels until they “found something good.” They destroyed so many wine barrels during this search and the subsequent revelry that their boots turned red as they “waded through 20cm of wine” in the cellar. Baumann’s wine-soaked adventure in the supply train came to an end with the German defeat at the Battle of the Marne. On October 26, 1914 Baumann recorded his unit receiving 1/4 liter cognac for every 10 men, which was the first alcohol his unit had drank in six weeks. 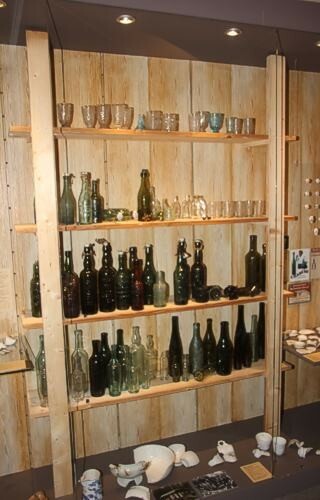 These beer and wine bottles were found by archeologists during a dig in Alsace-Lorraine trench sites. During the 1920s, Remarque also wrote lovingly about schnapps. This is no exaggeration: “It is easier to write about the psychology of women than to understand schnapps; schnapps has soul.” In 1924, he wrote schnapps cocktail recipes for a Hannover publication. His portrayal of schnapps and open love for the drink were mentioned as part of the right-wing backlash against him as a “banal” author of unpatriotic antiwar novels. 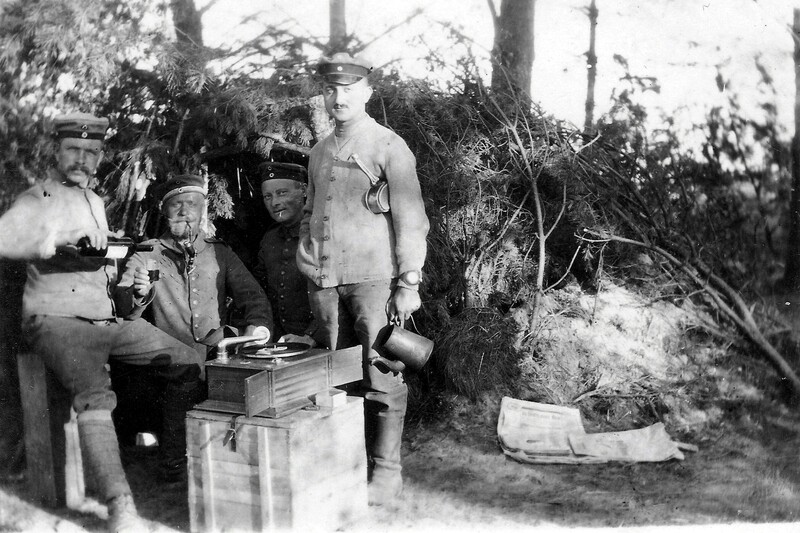 This 1916 photo shows artillerymen enjoying wine, tobacco, and music in a forest somewhere on the Eastern Front. Other novelists recalled alcohol’s presence in the trenches. Ernst Jünger‘s diary begins with an account of being issued Curaçao for the 1915 New Year celebration. In his postwar novelization of his war diary, Storm of Steel, Jünger mentions being issued with schnapps, beer, and wine. He discusses “downing several bottles of red wine” in a dugout after an artillery barrage and spending the last of his money on wine during preparations for the ill-fated 1918 Spring Offensive because there was nothing else his comrades could have spent the money on. Jünger’s Storm of Steel is also noteworthy because Jünger describes the experience of combat as Rausch, or intoxication. His portrayal of combat as intoxicating was an example of Jünger trying to emulate the “Rage of Achilles” in the Iliad, but this association set him apart from other war novelists. Jünger’s relationship with war and intoxication would continue throughout the twentieth century. He was stationed in Paris during World War II and recorded his experiences on the fringes of the resistance movement and in the heart of the French literary scene. One of his most famous passages from this period recalls an event where he stood on a rooftop enjoying a glass of wine with strawberries as the Parisian skyline exploded during an aerial bombardment. In the postwar era, he experimented with LSD and recorded its effects in Annäherungen: Drogen und Rausch. 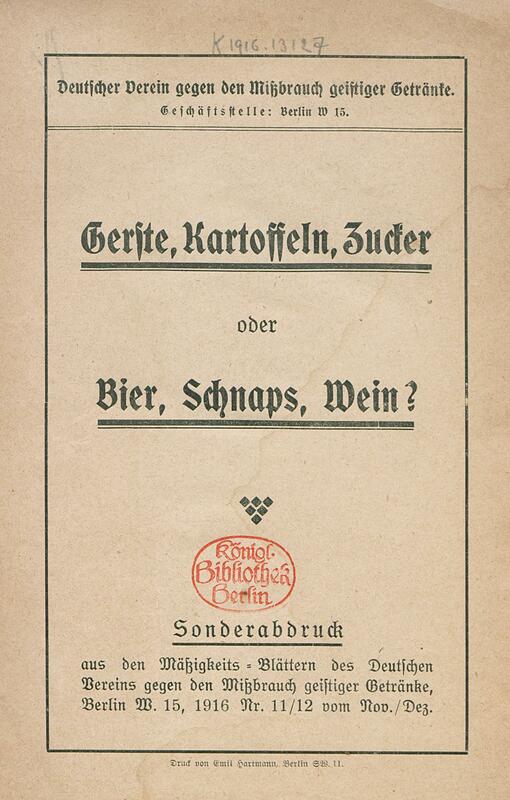 “Barley, Potatoes, Sugar or Beer, Schnapps, Wine?” This is the cover page of a pamphlet from the German Association Against the Abuse of Alcoholic Beverages. It argues that alcohol production limits food supplies that a blockaded Germany needed to conserve. As the war dragged on, Britain’s naval blockade of Germany created a nutrition crisis among the civilian population. Foodstuffs became scarce, and raw materials such as potatoes, barley, and sugar were necessary ingredients for alcoholic beverages. This pamphlet claims that civilians should eat barley bread instead of drinking beer and that brandy production was literally taking food out of the mouths of starving German children. The blockade of German imports would continue until Spring 1919, prolonging both the starvation crisis and the food shortage. The nutrition and food shortage crisis also affected soldiers at the Front. During the 1918 Spring Offensive mentioned above, German troops were suffering from a lack of supplies compared to their Allied counterparts. Although the Spring Offensive resulted in an initial breakthrough, the attack soon stalled as German troops captured Allied supply depots and began to gorge themselves on foodstuffs that had become rare due to the blockade. Troops especially discovered caches of wine– much as they had in 1914– and began to celebrate. This “last gasp” of the German army in 1918 quickly exhausted itself as soldiers simply stopped advancing. 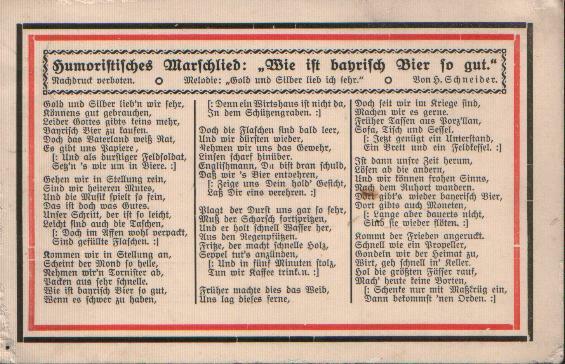 This postcard contains a marching song extolling the quality of Bavarian beer. Nicholas Johnson at the Points Blog continues his fantastic series on the role of alcohol at the front lines during World War. 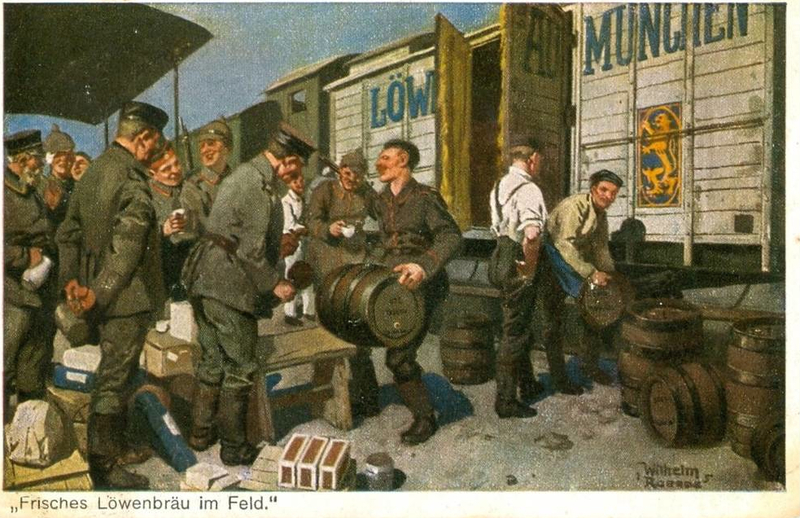 Part 4 looks at German Army and finds that the German soldiers access to alcohol were far more varied then those of Allied troops.